With technology advancing and the likes of Siri, Alexa or Google Assistant taking over our lives, one can only imagine what our phones have been picking up about us. Considering that these are AI, it's likely it is adapting to our texting habits and frequently used words, so I'd not be surprised if predictive text will hold the key to our fate in 2019. 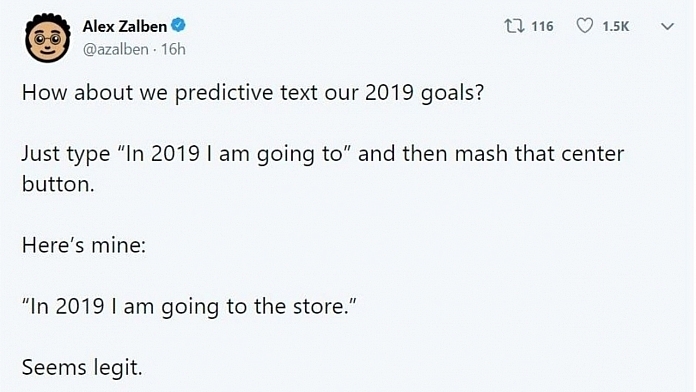 So When comic author Alex Zalben suggested typing "in 2019 I am going to" and allowing predictive text to decide the rest, people started getting some surreal predictions and were quick to share their results, some of them were creepy yet scary and funny at the same time. In 2019, I am going to the house to roll some of my favorite smells into a sad person. In 2019 I am going to the store and then we get to the work around the corner from there so I’ll be home by five. In 2019 I am going to the doctor and I will be there in a few minutes and I'll be there in the morning to see if I can get a ride to the airport on the 4th floor of the library. In 2019, I am going to go back and pick y’all off at work. That escalated quickly  Also I rarely type y’all. In 2019 I'm going to be pretty. In 2019 I am going to have a lot more than I can understand. In 2019 I am going to see the dentist. 2019 is not going to be a lot of fun I guess. In 2019 I am going to be a patient and then go home. In 2019 I am going to go back down there to see y’all. Mine was “going to go get my dad,” and since he died in 2017 I’m a little nervous now.